Underwear model as sculptural form. Mahogany Man. A creamy style with a tangy twist, the Creamsicle Access Trunk is everyone’s favorite flavor. The comfort waistband offers a secure fit for the soft touch micro-mesh in the front and open, backless design in the rear. A cut built for confidence, the Creamsicle Access Trunk features a supportive cup with a nearly naked feel, plus retro styling that adds a bold and playful touch for when you’re (un)dressed to impress. A Popsicle is a Good Humor-Breyers brand of ice pop consisting of flavored, colored ice on a stick. In 1905 in Oakland, California, 11-year-old Francis William “Frank” Epperson was mixing a powdered flavoring for soft drinks with water. He accidentally left it on the back porch overnight, with a stirring stick still in it. That night, the temperature dropped below freezing, and the next morning, Epperson discovered the drink had frozen to the stick, inspiring the idea of a fruit-flavored ‘Popsicle’ [pop as in lollipop, –sicle as in icicle; following on this terminological innovation, –sicle has become a libfix of wide application]. … The Popsicle brand began expanding from its original flavors after being purchased by Unilever in 1989. Under the Popsicle brand, Unilever holds the trademark for both Creamsicle and Fudgsicle. Creamsicle’s center is vanilla ice cream, covered by a layer of flavored ice. Creamsicle flavors include orange, blue raspberry, lime, grape, cherry and blueberry. 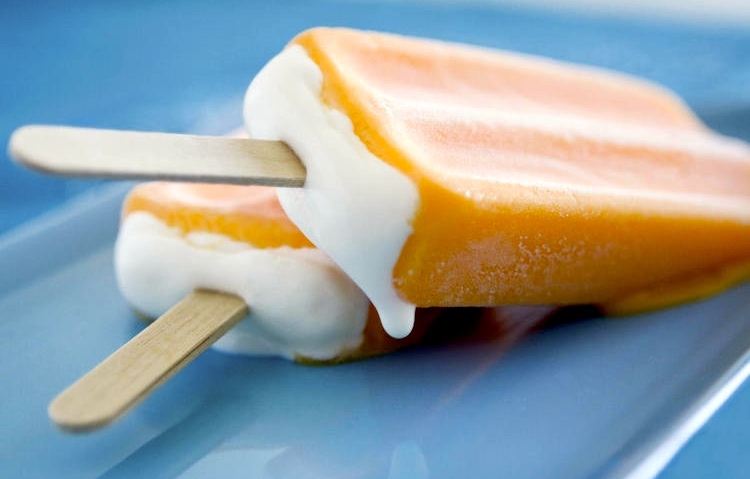 [The prototypical Creamsicle is orange-flavored (and -colored).] 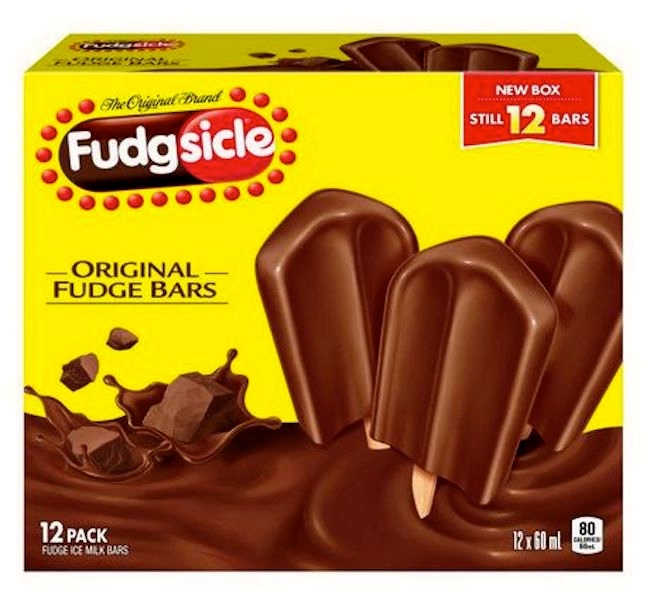 Fudgsicles are flat, frozen desserts that come on a stick and are chocolate-flavored with a texture somewhat similar to ice cream. verb pump: 1 [a] [with adverbial of direction] force (liquid, gas, etc.) to move in a specified direction by or as if by means of a pump: the blood is pumped around the body | [no object]: if we pump long enough, we should bring the level up. [b] [no object, with adverbial of direction] move in spurts as though driven by a pump: blood was pumping from a wound in his shoulder. 2 [a] fill (something such as a tire or balloon) with liquid or gas using a pump: I fetched the bike and pumped up the back tire | my veins had been pumped full of glucose. [b] informal shoot (bullets) into (a target). 3 [a] move vigorously up and down: [with object]: we had to pump the handle like mad | [no object]: that’s superb running — look at his legs pumping. [b] apply and release (a brake pedal or lever) several times in quick succession, typically to prevent skidding. [c] Baseball move one’s arm as if throwing a ball held in the hand, but without releasing the ball: [in combination]: behind the plate Howard double-pumped, then threw to second. [idiomatic] phrasal verb pump something up: informal [a] increase: she needs to read and pump up her political grip. [b] turn up the volume of (music): let’s pump up those tunes, man. [c] give inappropriate support and encouragement to: we let them pump up our egos. adj. pumped (up) [< pump up]: 1 (US) excited, full of something, usu. oneself [1971 Current Sl. VI:8: Pumped. adj. Excited. 1991 (con. 1920s) O.D. Brooks Legs 90: The thought of running a pool room by myself three hours a day, seven days a week, had me so pumped up hardly slept. 1992 J. Mowry Way Past Cool 265: Crack was intense, but cruelly quick. On top, where the boy had been a minute ago, you were pumped to the max. 2007 T. Dorsey Hurricane Punch 4: Can’t tell how glad I am it’s hurricane season again. I’m so pumped! Mahogany Man in #1 is pumped up (enlarged) by bodybuilding, and the photo aims to pump the viewer up, to get the viewer pumped (up), to excite the viewer. That’s what PUMP! does. This steamy photo adds two elements to the crotch focus of the underwear: the pitsntits presentation (with shaved pits) and a central preoccupation with the model’s pumped abs. Plus that face. And with a different, but equally intense, facial expression. Top to bottom: face, abs, crotch. Framed by sinewy arms. This entry was posted on October 17, 2018 at 6:58 pm and is filed under Clothing, Facial expression and gesture, Idioms, Language and food, Language and the body, Language in advertising, Libfixes, Trade names, Underwear, Verbing. You can follow any responses to this entry through the RSS 2.0 feed. You can leave a response, or trackback from your own site.